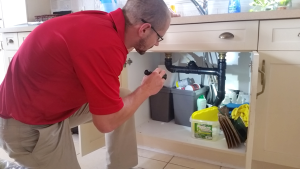 The testing of the plumbing system includes determining the types of plumbing supply/waste lines that are present and their condition. Testing for usable water flow and drainage at all fixtures is performed. We will verify the presence of hot and cold water at their correct locations. In bathrooms, we will flush all toilets 3-4 times to verify proper operation. Tubs and sinks are filled, drained and reviewed to determine present of active leaking. Showers will be run for approximately 10 minutes and reviewed. Floor drains are not within the scope of these inspections.